Cementitious adhesive, suitable for the reliable adhesion of thermal insulation boards. Advanced technology resins are contained within its fiber reinforced composition, providing great adhesion to substrates made of concrete, plaster, brick or cinderblock, as well as providing it with the crucial flexibility required in its various applications. 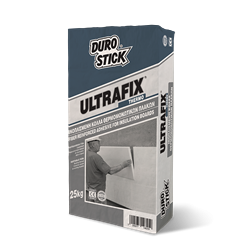 Also suitable for coating over the insulation boards when applied in combination with the reinforced fiberglass mesh, DS-4160 of DUROSTICK. On complete cure, coat the surface with HYDROSTOP PLASTER ELASTIC, the waterproof flexible plaster, available in smooth or textured finish. Alternatively, use HYDROSTOP SILICONE PLASTER or HYDROSTOP ACRYLIC PLASTER, both plasters in paste form. Classified GP: CS IV/W2 per EN 998-1. As adhesive:5-4kg/m², depending on the notch size and the substrate. As coating layer:5kg/m²/mm, to coat the fiberglass mesh.